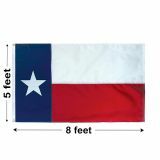 Tuff Flags specializes in Commercial Grade flags and supports the construction of our Texas flags with a 6 month guarantee. All our Texas flags are 100% Made in the USA. 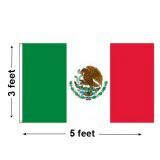 You find Polyester Texas flags for high wind regions and strong but light nylon Texas flags that fly in lightest breezes. 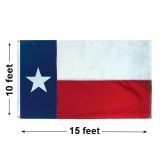 Our Commercial Texas flags are produced with the highest caliber Dupont inks and fabrics, both specifically developed to slow damage from UV rays. The commercial qualities of these Texas flags are extensive including industrial thread, extra wide hems, thick headers, and additional rows of stitching to give your TX flag the longest life possible. Government and Corporate Purchase Orders accepted. We will ship same day if order is received by 4:00 EST. 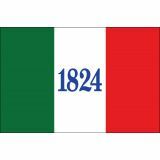 The Texas flag was adopted in 1845 when Texas became the 28th state. The Lone Star State is the only state to enter the United States by treaty instead of territorial annexation. Texas was actually an independent nation from 1836 to 1845 when it joined with the United States. Texans have much for which to be proud. 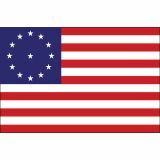 The simple design of the flag features a blue vertical stripe and two horizontal stripes, the upper stripe white and the lower stripe red. A lone five-pointed white star is located in the center of the blue stripe. The flag color blue represents loyalty, white stands for strength and red denotes bravery. One of the many, many interesting facts about Texas is that it has had 6 nation's flags fly over it. 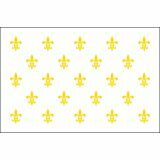 Spain, France, Mexico, Republic of Texas, Confederate States, and the United States. What an incredibly rich history! 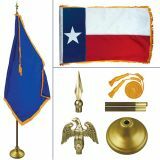 Browse our complete line of Texas Flags. If you're unclear or would like assurance before your purchase, please let us help. 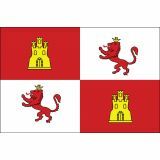 Call our toll free number (888) 287-3524, chat with us on Live Chat, or email us at customercare@tuffflags.com.